Scare Me added Torontoist's name to this composition of his own volition. We didn't ask him to do it. Scare Me added Torontoist’s name to this composition of his own volition. We didn’t ask him to do it. An absence of graffiti in Toronto? It’s true. When Ren was cutting his teeth, the Don Valley Brick Works produced bricks, graffiti alley was indistinguishable from any other laneway, and tag was a schoolyard game. Today, graffiti is citywide, Ren is a king, and writers vie for spots to put up their pieces. The number of graff writers has grown considerably. And to the chagrin of many, their ranks keep expanding. From Poser, to Toe Jam, to Poo Poo Face, Toronto appears once again to be birthing a new litter of vandals. On a bitterly cold February afternoon in 2011, Torontoist came upon the handiwork of graff freshman Scare Me. He had climbed the catwalk underneath the Leaside Bridge—the better to suspend a 2×6 metre cloth banner above the southbound lanes of the Don Valley Parkway. The banner, displaying a human figure consumed by fire, was up only days before the City removed it. Scare Me is nocturnal. (It’s ironic that one so enamoured of the night would use a ray-of-sunlight motif in his graff.) He’s a height junkie, too. His work on bridges spanning the Don Valley is proof of this. “Being outside when everyone else is asleep and leaving my mark on a rooftop [of a] building someone is sleeping in,” says Scare Me, of his ideal night on the town. One figure he is fond of putting up is a squid-like image. It brings to mind a recognizable action hero’s insignia. And like Batman’s crest, Scare Me’s calling card is found in some pretty impossible locales. Through various back channels, we made arrangements to meet Scare Me at Castle Frank Station. He arrived in the company of a fellow graff writer, Paus. With longish sandy-coloured hair and an introspective gaze, Scare Me resembles David Bowie in his youth. He speaks very little as we follow him off the sidewalk, down the western slope of the valley and beneath the Prince Edward Viaduct. The incline is steep, deeply grooved by erosion, and strewn with litter. When subway cars thunder overhead every few minutes, it is instinctive to flinch—but Scare Me and Paus don’t. Engrossed by the graffiti under the viaduct, the pair scarcely notice the racket from above. Pausing, they discuss the merits of several pieces, making repeated reference to the works of Marc Chagall. They’re right near the top of the bridge’s support columns. Attempting to reach them would be suicidal. Crossing Bayview Avenue, we follow a double set of train tracks north. Near the Evergreen Brick Works, we double back. Scare Me’s search for the ideal spot to put up his work is complicated. It has to be a place where the graffiti won’t be removed right away, and his preference is not to paint over another writer’s work. Eventually, the search ends at a retaining wall below the Don Valley Parkway near Pottery Road. As drivers hurtle by unaware, Scare Me gets to work. He removes a red spray can from his backpack and shakes it vigorously. He puts on a respirator that covers his mouth, his nose, and most of his face. Briefly, he and Paus consult a sketch they drew earlier on crumpled paper the size of a pack of cigarettes. He begins with a red outline. For the next two hours, he paints without stopping. Cold winds blow the length of the valley. A red-tailed hawk circles above, gliding on thermals. Slowly, an image begins to form. Could it be this thought keeping him warm? Whatever it is, he shows complete focus on the task at hand. When the work is done, we linger a few minutes, talking. Scare Me puts the spent aerosol cans in his backpack, and then he and Paus critique his newest creation. On the way out of the valley, we ask Scare Me what he considers to be the most difficult part of writing graffiti. Torontoist is profiling the city’s graffiti artists, uncovering their best work and finding out what makes them tick. 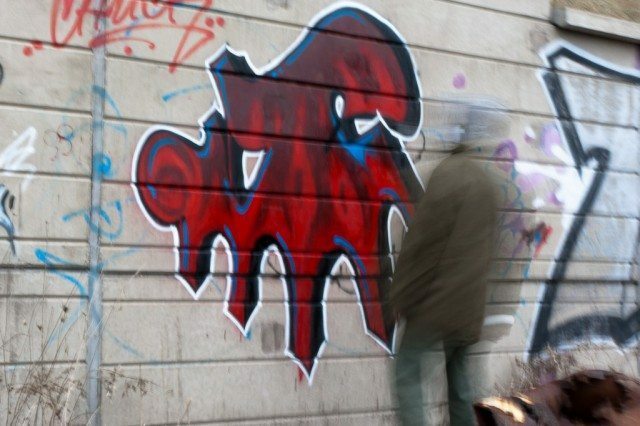 Are you a graff artist or do you know one who’s interested in being profiled? Email us.